For the first time in more than a century, asbestos mining in Canada has halted. Canada’s two mines, Jeffrey Mine and Lac d’amiante du Canada, stopped asbestos production earlier this month because of financial obstacles and operational difficulties. The asbestos industry in Canada enjoys long, lucrative and tumultuous history, and this marks the first time in 130 years that the country’s asbestos mines are shut down. The stoppage reignited a debate of the dangers of asbestos. Protesters were recently on Parliament Hill advocating for the mines to be shut down. While asbestos companies believe the shutdown is temporary, critics are hopeful that Canada’s halt of production is permanent. Canadians appear divided on the issue of asbestos mining, production, exportation and overall use of the mineral. Historically, the Canadian government supported the industry through favorable legislation and economic incentives while opponents, especially those from the scientific and medical community, pushed back against those same incentives and also pushed for heavier regulation. Earlier this month, opponents gathered on Parliament Hill to advocate for the final closing of the asbestos industry. “I wonder (if) it doesn’t make them feel bad inside, because they don’t know how it feels, they don’t know how it feels to have a grandmother and a grandfather die of asbestos,” said 11-year-old Cavanagh Matmor, one of recent protesters on Parliament Hill. She lost her grandmother to an asbestos related illness. Scientists concluded in the 1970s that asbestos exposure caused diseases such as mesothelioma, which is a rare cancer of the lining of the lung. This cancer causes between 2,000 and 3,000 deaths per year in the United States. For Matmor and her family, hope remains as they are not alone in this fight. Even some in government oppose the use of the substance. 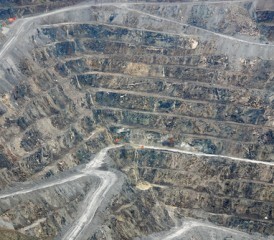 On the other side, mine officials seem confident production will resume as soon as the spring of 2012. Bernard Coulombe, Jeffrey Mine president, believes that recent events are just temporary and that the industry will return to normalcy soon. “It’s not closed . . . fibre is still being sold,” Coulombe said. Coulombe believes that demand for chrysotile asbestos remains strong and because of that, Canada should supply the demand from the Jeffrey and Lac d’amiante du Canada mines. His statements are more evidence that the economics of the asbestos industry benefited Canada for a number of years, which may provide an explanation why government regulations have been as they were. Because of the many variations of the mineral, Canada has argued that some forms of asbestos like chrysotile can be handled safely without causing exposure. Asbestos was commonly found in thousands of products like brakes, piping, ceiling tiles, insulation materials, dry-wall and countless other materials. In Canada, the mineral is shipped to poorer countries with less strict safety regulations. During the early 1900s, Canada’s asbestos accounted for 85 percent of the world’s production, according to the U.S. Geological Survey. The mineral was considered so valuable that the U.S. military established plans in the 1930s to protect the mines in Quebec against potential German control, during World War II. As of 2010, Canada’s asbestos production accounted for about 5 percent of the world’s supply. The recent halt of production of the Jeffrey Mine is because of financial troubles. The mine needs to raise $25 million in order to receive a guaranteed loan from the government of Quebec. This will allow the mine to resume mining activities. The Lac d’amiante du Canada has stopped because of operational limitations that may or may not be quickly resolved. CBC News. (2011, November 24). Asbestos mining stops for first time in 130 years.